I've a had few emails in recent weeks encouraging me to do a home tour, I've seen some absolutely stunning examples of these featured on the pages of other bloggers and have really enjoyed taking a peek behind closed doors. Our little maisonette is a rented home, one part of a large old house complete with beams, sloping ceilings, creaky floorboards and the requisite troop of spiders (or Borises as they're known by us). The decorating and prettifying is still very much in process but I'll definitely post a few snippets as things are finished, until then I've snapped a little corner or two and a couple of recent crafty additions. I don't currently have a noticeboard, I've been looking for a big cork pin board to pimp and fill with inspiration for a while but I haven't come across any in the local charity shops and I'm loth to part with £20 for the one I've seen elsewhere. 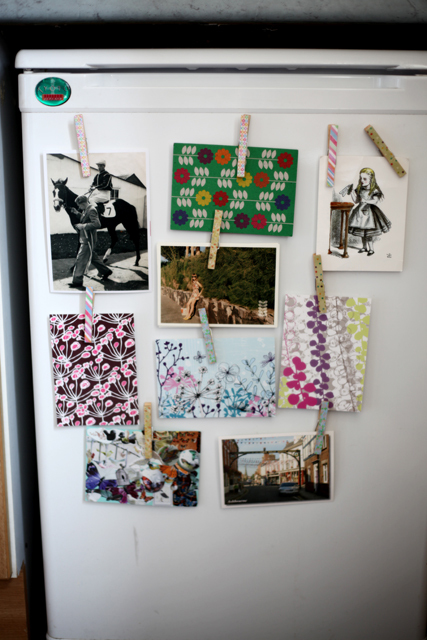 So the fridge has become a place to pop the odd pretty thing for now - I bought some clothes peg magnets on Folksy (before I made some of my own) and picked out a few postcards I thought would look good in the kitchen, although the top left image is of my Grandad leading in a racehorse he had trained. 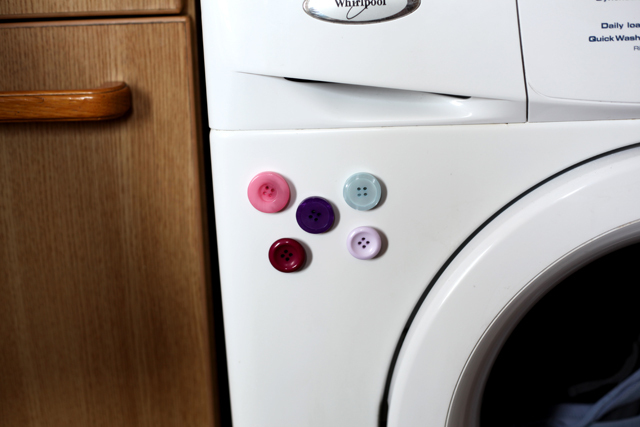 Superglue + magnets + vintage buttons = something to brighten up the washer a little. I can't stop making these little button magnets as they're so simple and can be stuck anywhere metallic! 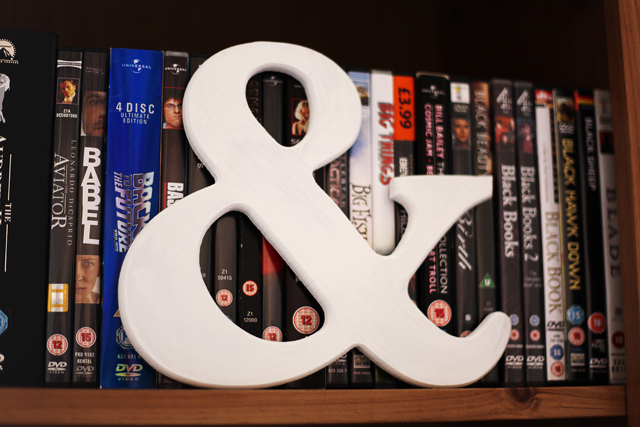 Little wooden letters and punctuation marks are something I can't get enough of - I picked up this ampersand on eBay for £1.30 including postage a couple of months ago. It came in unfinished MDF and the first impulse was to paint it white and white it stayed for a while, but then my Mod Podge arrived and suddenly my whole world became about getting it open and getting my craft on, so I cannibalised more pages from a decrepit old copy of Little Women and got busy. I'm quite pleased with the way it looks now and I think I'll get another and use some of my old atlas pages to decorate it for the bedroom. I like little random touches about the house, I had a fit when I opened a rose bulldog clip as a present this Christmas from a friend who knows me far too well. Pretty things and stationery combined in one sweet little package - what's not to like?! The collage postcard was another Folksy find and handily used up the 90p left over in my PayPal account! Perfectly patriotic for today and the Royal Wedding flag waving. The nooks and crannies in this place are what I love the most - so many interesting, unexpected little spaces to hang more stuff - like the sloping hallway corridor. 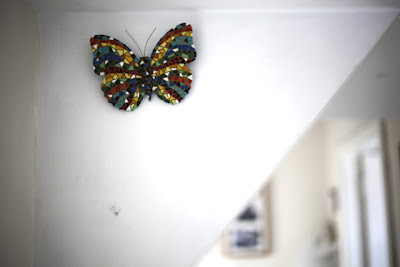 My parents bought me this mosaic butterfly from Barcelona when they visited for their silver wedding anniversary a couple of years ago and went to see pieces of Gaudi's work all over the city. The downside of random low ceilings is that visitors (namely my 6ft plus Dad) occasionally clonk their heads even with fair warning! Nowhere near a comprehensive look at my house not all that inspiring, but here are a handful of my favourite blogs who have infinitely more exciting home or garden tours in their sidebars! Hope you're all having a lovely day whether you're partying to celebrate the Royal Wedding or just enjoying that Friday feeling! Why don't you buy an old picture frame in a charity shop and take out the glass and paint the boarding in magnetic paint? Should only cost £10 tops. I love the idea of the ampersand as a blank canvas. The black and white (and read all over?) of Little Women exactly fits the bookcase where it is sited. The themed possibilities are endless; for instance bringing in colour magazines etc, and what a great idea for a present. Off to Ebay to see if I can get one. It was lovely to have a sneak peak at your home Jem...it's the little touches like yours that make a house a home. And things like creaky floorboards too. Now I'm going to have a look at your favourite blogs. Thank you for a sneak peak of your home, Jem! i too have a small crib which is crumbling down as we speak and had to be carefull where i stepped as the floorboards might collapse! 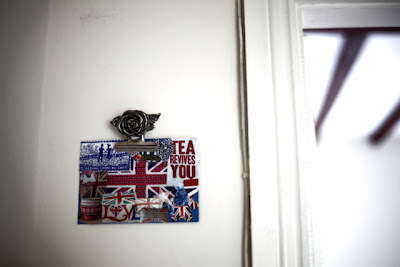 hahaha love the fridge magnets and notice boards, I adore the union jack with tea quote postcard you got at folksy, the cute little buttons on your washing machine, now that is an idea! im crazy about mod podge! love the result of your wooden letter with little women paper on it! the butterfly is soo lovely! Just finished watching the royal wedding here, can only watch so much as the house chores are calling my name..urghh! Lovely to see a few of your nooks and crannies - oo err! I love what you've done with the ampersand, I'm definitely going to do something similar at some point. Having a great royal wedding day although have eaten too much gingerbread and too many pink meringues! 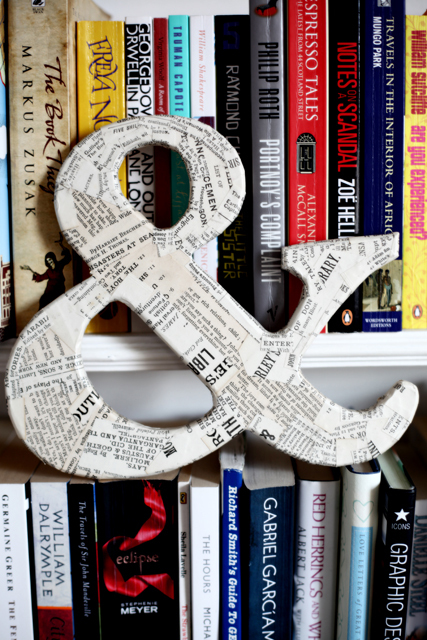 Love the button magnets and your ampersand. They turned out wonderful! Thanks for joining TTF. Have a great weekend! I'm tempted to buy magnets and glue them to as many buttons as I can find and cover my washing machine in them!!!! I enjoyed looking at your nooks and crannies just as much as if you's taken pics of the entire house. You really know how to perk up the boring bits in your home (ie the washing machine!) Inspiring, thanks! This is my first time to your blog and I feel like a kindred spirit. I am your newest follower. I hope that you will come by for a visit too. Found your lovely blog thru my link up to Laurie's Fav Things party and am so glad I did! I love looking at other people's houses. Love the little button magnets. Much better than the Thomas the Tank Engine magnets that's decorating my washing machine.